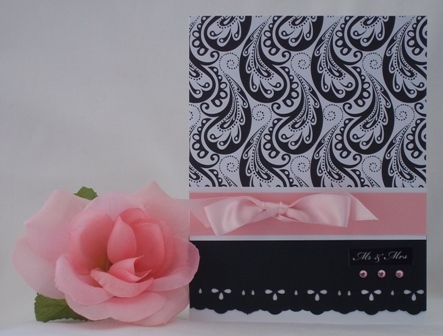 I love pink, black and white for wedding card designs. Paper card making ideas to make wedding cards can start from a sketch, paper or craft punch. This handmade wedding card idea came from an ebook that features lots of sketches. For this handmade card making project, I altered the sketch a little bit but kept most of the foundation of the design. 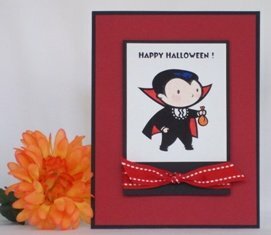 I think the author of 50 Card Making sketches uses pattern paper that is a bit outdated but you can use your own cute paper for modern handmade card ideas. The author includes instructions and measurements so that makes card making easier and faster. The set of ebooks also includes birthday quotes to use on your homemade greeting card ideas so that maybe helpful to someone who is always making birthday cards. For those of you who are just starting out, the set of ebooks includes "Card Making Tools - The Essentials of Card Making", a guide to help you on what supplies you might need to get you going for your hand made card ideas. Also included is an ebook on adhesives which comes in handy since there are so many to choose from. For your paper card making ideas, the author gives you tips on how you should adhere vellum since it's a bit tricky. Overall, you get a lot of helpful information from the set of ebooks and I find myself referring to them often when working on handmade card making projects. You can use sheer or satin ribbon to make a wedding card. I used a pink satin on mine and cut the ends at an angle. Satin makes it look like a premium wedding card. 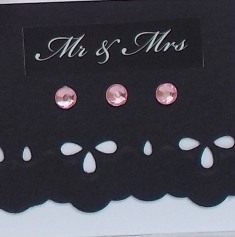 For my handmade wedding card, I used a black sticker that said "Mr & Mrs" in white ink and it blended in nicely with the black paper. On my wedding card designs, I try to keep the same foundation of the sketch but sometimes I alter it a bit. For my card, I made the white border around the pink paper thinner and I put my sentiment on the bottom of the pink strip instead of on the pink strip. Experiment with border punches when making wedding cards. I used a decorative border punch on black paper and it pops when taped in front of white paper. I added pink adhesive gems to give it a little bit more sparkle. Wedding card designs can be simple or elaborate and that's where your creativity can shine. You can't go wrong when making handmade wedding greeting cards. The bride and groom will appreciate the effort. Here are other examples of handmade cards using 50 Card Making Sketches. For this homemade card, I used the same sketch as the wedding card above but changed a few details. I extended the scallop border of the card to the end of the bottom and made the cream border strip thicker than on the wedding card. I also added a sticker and brad instead of ribbon and gems. Here's another handmade card using sketch #49 from ebook 50 Card Making Sketches. You can make the card simple or more complicated. I chose to make it simple whereas the sketch had more layers of paper.